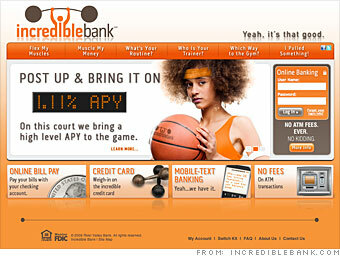 This Internet bank's Incredible high-yield checking account currently pays a 1.06% APY, much higher than the national average. The account is free unless you request paper statements, but you do need a $1,000 minimum deposit to open the account. There are no ATM fees, and the bank reimburses customers for charges incurred when using other banks' ATMs. Like most Internet banks, you need to mail in checks or make inter-bank transfers if you want to make a deposit. Some banks are now charging you for talking to a human teller, forgetting to notify your bank of your new address, losing your credit card, or cashing in your loose coins. I ditched my big bank!